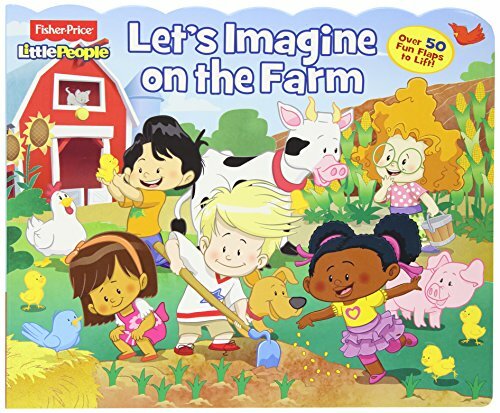 My older son was given a Little People Farm for his first birthday and it brought back memories of the Little People I played with as a little girl. They have gone through a bit of a make over since those days and appear to be much safer to play with, but the basic idea is the same. 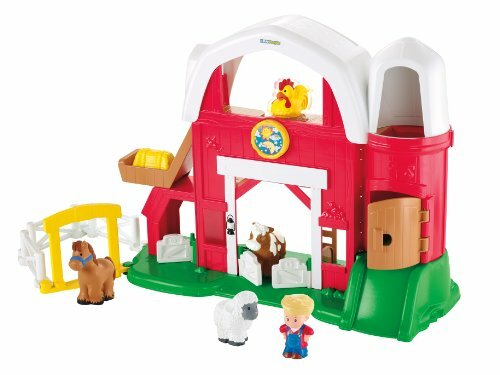 The version we have doesn't seem to be available anymore, but this Fisher-Price Little People Fun Sounds Farm looks similar. We have introduced the animals to my almost 1 year old who likes to try to mimic the animal sounds we make. My favorite is when he tries to say "neigh!" He even "shakes" his voice in a high pitch when he makes a sound, I need to record him doing this! While at the LA Festival of Books one year, my then 1 year old son chose a Fisher-Price Little People Lift-the-Flap Book. It was titled Let's Go to the Farm. It also doesn't seem to be available anymore and looks to have been replaced by Let's Imagine on the Farm. They look to be similar books where the child can lift the flaps to learn colors, animal sounds, and shapes. We have gotten a lot of use out of our Lift-the-Flap Book and it has held up well to a toddler's hands. I have heard from other parents that the Lift-the-Flap books have been popular with their children as well. Whether together, or separately, these Fisher-Price Little People items make a great gift for toddlers!